Designed specifically for use in Paris Trucks as well as those that have a slightly larger bushing seat. The slightly larger shape will fill that seat snugly, thus eliminating the chance of dead-space or slop that can result in a weird, not-in-full-control feeling. 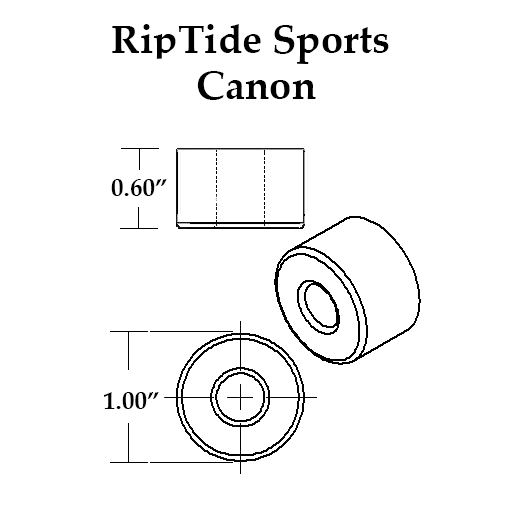 The Canon shape itself is an ever-so-slightly larger barrel. Use as a double-barrel combo or use roadside and combine with the Magnum shape for a super-plush experience with impressive turnability and control over return-to-center! Canon & Magnum Bushings are a slightly wider diameter bushing that is well-suited for Trucks with a slightly larger bushing seat than average, such as Paris. Not sure what size bushings your trucks will work with? What combo bushings to use? Which Formula to choose? Got these for my Paris V2's on my 46" Timber. Before I had 85a khiro barrels. They worked ok for older bushings. After a long talk with a helpful person at Riptide I got the 87a Canon and 85a Krank roadside. 1 full turn of the nut set the tool down and the feel was 100% better. Deep carves without being tossed, stable at pumping. So very surfy feel to the board now. Very happy and now to get those cross steps dialed in. First off, Brad and Tracey are fantastic. I was in need for some better bushings for my Esk8 build. Brad helped find the right combination for my setup! Went with the 93a C/C as well as the Cannon/Chubby for the back. Everything has been going great. Stability is fantastic with great rebound. I avg most rides in the 25mph range with sprints to 30. The setup leaves me extremely confident on the street. Also putting this same setup on my next high speed build. I could stay here and write a book about the product and especially the customer service. But it is simple, RipTide Kranks are amazing and the customer service is amazing! Stop reading and go buy! Riptide bushings have not failed me. There is a unique feeling with the Riptides that cannot be had with any other type. It's as if these bushings have a mind to predict your leans to allow for one of the best follow throughs without the slop often had with other competitive bushings. For a very carvy, divey ride, I've put these Krank Canons (87a, if you're under 170lb) boardside paired with Krank StreetBarrel (87a) roadside. This is the setup I use for my Loaded Dervish Sama for surf style carving. For more control, I set up with Krank Magnums boardside and Canons roadside. Thanks again guys for spot on recommendations!